Press Room Group co-founder Alan Lo and Jia Group’s Yenn Wong got married in 2011. Over the last seven years, they have added four-year-old Gregory and 14-month old Gabrielle to the family. Together with Bob, their lovely border Collie, the family of five are showing off their new home while gathering at the table over meatballs and spaghetti. What was your first thought when you heard you were about to become a father? The first time Yenn told me our family was going to grow, I was at the crossroads of nervous, excited, elated and—if I’m honest—a tiny bit terrified. After Gregory arrived, the first three months were a blur, but it felt fantastic. How does your upbringing help your view of fatherhood and how to raise your children? My parents always taught us that respect was key. At first, this was respect for my family, friends and those that helped at home. Then it grew to include my teachers, classmates and later colleagues and business partners. Our boys will always know the role respect plays in being a good person. How would you categorise your parenting style? Can you give us an example of teaching your children the right lessons? Our parenting is disciplined, but fluid—there is room for movement and learning. You want to give them the freedom to find out about themselves and grow into their own. We do have house rules that need to be followed—Gregory is quickly learning the art of doing his own dishes, and that if he makes a mess, it’s his responsibility to tidy up. Spoiling is an easy option and something we don’t want to do. Together we’re ensuring that from an early age they know money doesn't grow on trees, and nice things aren’t a right—they come from hard work. What would you consider to be a successful parent? Everyone’s experience and circumstances as a parent are different and so is the notion of “success”. If we can help shape our boys to be considerate and kind creatures, that contribute to their communities, that’s definitely a step towards “success”. What role does food play in your family time? Food plays a central role in our family. Sitting down to eat at the end of the day with loved ones isn’t just about eating, it’s about connection. It helps you compartmentalise work and play. Our evening meal times, or perhaps lunch on the weekend, might be just the four of us. Our parents, friends and/or visitors might join—if so the meal might become a little more creative, but either way, the food is good, nutritious and honest regardless of what’s on the table. Below the table, you might find Bob asking for scraps—he is probably one of the most well-fed dogs in Hong Kong. Aside from food, what other things will you do with the family? Aside from good food, family day is about pausing and taking time to chill as our own little unit. Because during the week it’s go, go, go! Granted the heat in Hong Kong right now limits how much time we will spend outside, but when it’s cooler, we go to green spaces. 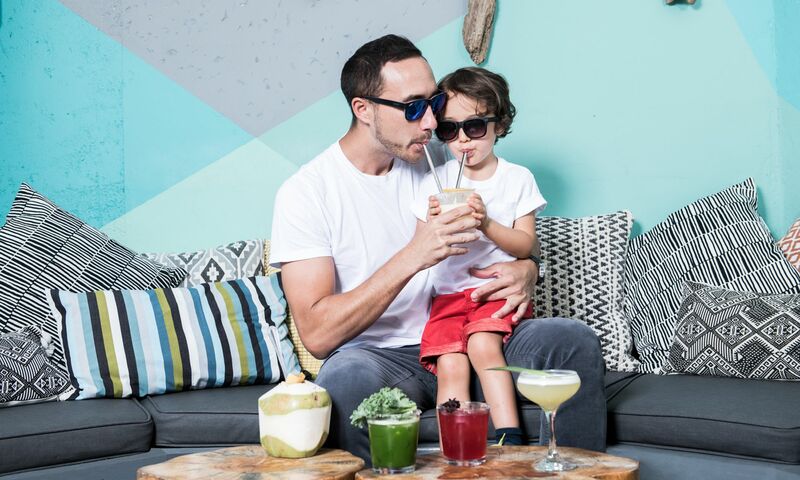 Calvin Ku, food and beverage director of Buzz Concepts and the visionary behind Lan Kwai Fong's popular Lily & Bloom, wife Alicia had their son Christian a little over two years ago. Despite their fondness for fine dining, the family of three observes rather strict dietary rules, from cutting added sugar to adding daily vegetable intake. Calvin is excited to share his side of the parenting story and his journey. After we were married, Alicia and I had a plan to have children. We started with some visits to the Chinese doctor to help build up our health for that. One day my wife visited the doctor and he suggested her taking a pregnancy test, which quickly confirmed pregnancy. It was in the early stage of our plan, so we fast-forwarded everything to accommodate the baby. We were so delighted for Christian’s arrival, of course, and it is beyond our words to describe that joy. How does your upbringing help you shape your view on fatherhood and devise methods in raising your son? I grew up in a family of three boys, so siblings were always spending time together. When we were little our extended family would always hang out, families joining dim sum lunches and family dinners. We uphold that tradition still. As we have our own family now, Christian still gets to see his cousins rather often. It is important to hang out with other family’s children, to be close to your family. What are some of your son’s favourite things to eat? My wife Alicia and I are both health-oriented. We try to keep that for our son too. At home, we use less salt and cut refined sugar in our cooking. It sounds harsh for a two-year-old child but we are delighted to see our son enjoying carrots and edamame. Christian’s favourite treat though, it must be the breakfast I cook for him. I’d make French toast or pancakes, with a healthy banana-blueberry and hazelnut sauce instead of syrup. It’s a winner for all of us. What are some of your worries for your child? Children don’t grow up by themselves, there must be a social factor to it. Our biggest concern is that our son is not surrounded by good peers. By that I don’t mean just people his age, but also teachers, friends, and others that are going to make a footprint on his upbringing. Technology is also something that we, as parents, should be aware of. Christian only watches television on the weekends, and we make a conscious decision about screen times for him. We simply will keep him from being overstimulated on the computer or other portable devices, at least not when he is this little. How does your family spend weekends and holidays together? We try to spend as much time outdoors as possible. Good thing Christian is an outdoorsy guy himself with so much energy. We’d go for walks, and enjoy outings together. Christian loves spending time at the park’s playground, and he loves sandy beaches. We recently spent a few days in Singapore, and Christian and us had such a great time at the local waterpark together. Malcolm Wood, one of the co-founders of Maximal Concepts, is known best for managing all things food and drink at his fleet of dining establishments from Mott 32 and Stockton to the newly relocated Mercedes Me store and The Flying Elk. A father of two children with a large age gap between the siblings, Wood is excited to share his wisdom when it comes to managing his family—a style that is very different to his management style at the office. I have a 14- year-old daughter and a three-year-old. The age gap is actually really nice as my daughter is super helpful with our son Marlon and these duties have helped her to be more responsible much quicker. Besides the children, we also have a dog, two cats, some fish and a pet gecko. I’d say it’s a busy household. What was going through your mind when you received the news on becoming a father? You really don’t know want to expect when you have your first child. The first time you see them your world changes and you fall in love again. It’s a strange feeling of loving and wanting to protect, I guess, as a new father. It's interesting to see that fathers, in general, are close to their daughters and the sons are more attached to their mothers— well, that’s the case in our family. How does your upbringing help your view on fatherhood and the methods you use for raising your children? I think both the father and the mother need to play different roles in the family. Both can be interchanged but there is always time to be loving. I guess the one thing that you need to remember is that you need to teach by example. It’s hard as a parent as you just want to switch off when you come home and put your feet up but your kids are there watching and absorbing. What would you consider to be a “successful" parent? I think our kids teach us just as much as we teach them. I would never consider myself a successful parent. There is no school for it, there is no test for it and every child is different. You need to keep learning and keep adapting and as your children grow you need to try to grow with them. In Hong Kong life can be tough and working hours can be long. Also being in the restaurant industry often takes you away from your family during dinner time. Sunday lunch was a big thing for me when I was growing up in the UK and I always have fond memories of sitting around with my grandparents and family eating together. So we try to have one good big meal together every Sunday as a family here in Hong Kong and I really like this family time with my kids, just like my time with my grandparents. What are some fun ways to get your children to try new things in food? My daughter went through a phase of only eating something new if I cooked it for her. My son is going through his “everything has to have ketchup” phase. You have to do what it takes to make kids eat sometime. Now my daughter is like me and eats everything! What are some of your children’s favourite things to eat? It is definitely ketchup. All joking aside, we try to let them eat as much variety as possible. If I was going to name one they both are crazy about homemade dumplings. As co-founder of local group Black Sheep Restaurants and a chef by training, Christopher Mark is no stranger to the Hong Kong dining scene. Between running restaurants and a hardworking fleet of chefs and staff, Mark candidly shares his parenting tips while he and his daughter Parisa, 13, created an off-menu strawberry lattice pie at the company’s central kitchen. What was your first reaction when you heard about becoming a father? Panic and fear. Just joking, I was very much excited to find out we were having a girl and the experience of becoming a father is the proudest achievement of my life. How does your upbringing help (if any) your view of fatherhood and methods of raising Parisa? Where I grew up in Canada, children had a lot a freedom, so I try to give her the independence to experience life in her own way. I do want to be involved and am there for her, so I try to provide her with the tools so she can come into her own. How important is communication with your child when it comes to parenting? We stay in close communication, but as a teenager, she has her own interests and social network. We have a strong sense of trust in each other so she updates me on her doings and I have confidence she’s making good choices. Food is central to our family time. We base our travels around where we should eat, we spend a lot of time together in the Black Sheep restaurants and cook together whenever possible. What do you think are some of the more fun ways to get Parisa to try new things in food? My daughter has a discerning palate, but she’s not picky or snobby. I didn’t make a big fuss over trying new foods when she was younger so that she could develop her own opinions. However, when I was first opening restaurants I didn’t have much money and could only afford to eat sushi on occasion. When I had enough cash to treat Parisa to her first sushi dinner, I told her the uni was ice cream to encourage her to try. She then ate the uni off all 10 pieces of sushi, just leaving the rice. I was upset at the price but impressed by her appetite. Aside from food, what other things will you do with the family together? We escape to our beach house on Lantau whenever we can to relax with Chloe, our Rottweiler. Parisa and I will hang on the beach all day then play board games at night. She's is getting too good at chess, so I need to find something else I can beat her at.